Why does a centralized financial institution need blockchain and its own coin? Is JPM coin a real cryptocurrency? Will other institutions follow suit? Find the answers and more below. JPM Coin is a digital coin based on a permissioned blockchain, designed to enable instantaneous transfer of payments between institutional J.P. Morgan accounts; in other words, a measure introduced by the bank to reduce their settlement times, specifically for international payments and securities transactions that migrate to the blockchain. Within this system, 1 JPM Coin represents 1 USD, and over time, JPM Coin may come to represent other major fiat currencies. Is JPM Coin a cryptocurrency / stablecoin? Though the crypto media introduced the JPM Coin as a “cryptocurrency” and a “stable coin”, J.P. Morgan actually refrains from using any crypto-related terms. This is because JPM Coin is neither a cryptocurrency nor a stablecoin. It cannot be bought or sold for dollars — it merely “represents” dollars in the context of payments between institutional J.P. Morgan accounts. Can I acquire a JPM Coin? JPM Coin is not sold on any market, and cannot be freely exchanged by holders. Furthermore, not just any J.P. Morgan client can use JPM Coins: Umar Farooq, head of Digital Treasury Services and Blockchain at J.P.Morgan, has said that JPM Coin is designed for institutional clients and business-to-business money transfers, and there are no plans to use it for individual clients in its early stages. Does JPM Coin change anything for end clients and individuals? End customers of institutional clients will benefit from the launch of JPM Coin because it will reduce costs and increase the system’s overall efficiency. 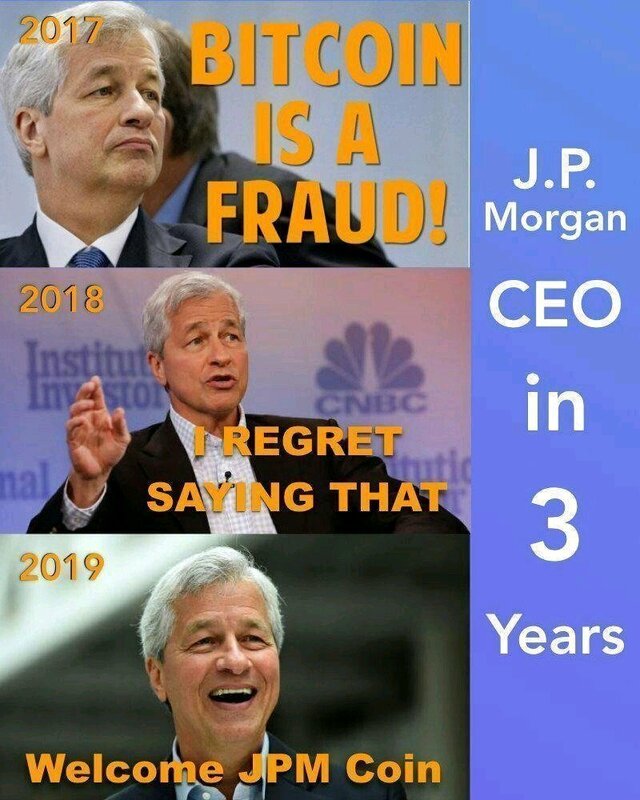 According to CEO Jamie Dimon, one day, JPM Coin could be used for retail payments: “JP Morgan Coin could be internal, could be commercial, it could one day be consumer,” he said during the company’s annual investor day, a statement that seems to contradict that of Farooq’s. Is JPM Coin already working? As Umar Farooq stated, JPM Coin is currently just a prototype. They have already tested money transfers and are sure that payments will be instant and safe. In the subsequent development stages the coin will be validated to acquire all necessary regulatory approvals. How does JPM Coin work? JPM Coin will run on Quorum, the bank’s permissioned blockchain based on the official Go implementation of the Ethereum protocol. There are plans to extend JPM Coin to other platforms and make it operable on all standard blockchains. In step 1, a client makes a USD deposit and receives the equivalent amount in JPM Coins. These will represent the deposit in the blockchain. In step 2, JPM Coins are transferred via blockchain. In step 3, a recipient of JPM Coins redeems them for USD. What are the use cases of JPM Coin? International payments for large corporate clients. The new system will replace the outdated wire transfer system; it will settle payments in real time and round the clock. Securities transactions. Once you've bought an issuance, payment will follow settlement instantaneously, no waiting time. Treasury services business. Large corporations will use JPM Coin to replace the funds they hold in various subsidiaries. According to Farooq, it is a way to ensure that a subsidiary can represent cash on the balance sheet without having to actually wire it to the unit. We cannot stress enough that JPM Coin is not a cryptocurrency in the common sense of the word. Think about it in this way: Satoshi Nakamoto first described Bitcoin on October 31st, 2008 as “a purely peer-to-peer version of electronic cash (which) would allow online payments to be sent directly from one party to another without going through a financial institution.” On February 14th, 2019, J.P.Morgan Chase, one of the largest financial institutions in the world, announced their own digital coin. It was immediately dubbed a cryptocurrency by headline-hungry media outlets, but that is a separate matter. JPM Coin is centralized, governed by J.P.Morgan Chase, and regulated globally, while most cryptocurrencies at least strive for a high degree of decentralization. JPM Coin will run on a private (permissioned) network — Quorum — while most cryptocurrencies run on public, permissionless networks. JPM Coin does not resemble cash in the ways that cryptocurrencies do. Cryptocurrencies are a medium of exchange for goods and services, and are used to invest; JPM Coin on the other hand can only be used for institutional clients’ transfers and payments. There’s a lot of buzz around JPM Coin, both in the crypto community and in traditional finance. While some in the media call the digital coin the “XRP killer” or even the “Bitcoin dream killer”, others have remained skeptical, reminding the public that JPM Coin is not a “true” cryptocurrency. Below, we examine the arguments of both parties. Non-crypto media seem most excited about the JPM Coin announcement. Bloomberg went as far as to claim that JPM Coin boosted Bitcoin’s price, allowing it to reach $4,000 on February 19th — a full 5 days after J.P. Morgan’s announcement. The source claims the new digital coin could have “a positive effect on the industry” and help create “an optimistic environment that pushes most crypto prices higher;” but the delay between the announcement and the surge makes us skeptical. Ben Walsh from Barron’s claims “JPM Coin just killed the Bitcoin dream”. The Washington Examiner was more subdued, calling JPM Coin “an alternative to Bitcoin”. The article showcases experts’ negative opinions on cryptocurrencies and praises JPM Coin for avoiding the volatility and the potential to “undermine financial stability” that characterizes crypto (in their view). Forbes was not as enthusiastic, and appealed to readers to not to call the coin a cryptocurrency, for the reasons we previously explained. The crypto media did not hold back their two-cents’ worth. Scoring up Dimon’s remarks against crypto (he famously said that Bitcoin is a fraud that will blow up), CCN.com even branded JPM Coin a “fake cryptocurrency”. Jerry Brito, executive director at Coin Center, shares this opinion: “I see folks referring to it as a cryptocurrency. It’s not a cryptocurrency. A cryptocurrency is one that is open and permissionless.” Bill Barhydt, CEO of cryptocurrency-based payment platform Abra, didn’t confine himself to JPM Coin criticism, and claimed that “all enterprise blockchains are nonsense, (and are) going to fail miserably”. The crypto community on Twitter took the opportunity to make jokes and create memes, most recalling Dimon’s harsh words for crypto back in 2017. Still, some people are optimistic about JPM Coin; this gif shows Dimon literally beating Ripple — a clear analogy for some high expectations. To end on a high note, let’s mention Ilya Zaki’s favourable view on JPM Coin. The head of Business Development & Marketing for Moonwhale Ventures claims that JPM Coin is awesome for blockchain adoption. “With the introduction of JPM Coin, we now have clear representation from one of the biggest corporate names in the world. The creation of JPM Coin serves as a credible validation of the massive potential that lies within blockchain technology,” he said. It looks like other banks were ready and waiting for J.P.Morgan Chase to shoot first; just a couple of weeks after the JPM Coin announcement, the world has welcomed two more banks’ plans to create their own digital currencies. The Japanese Mizuho Financial Group had revealed its plans to launch a yen-pegged J-Coin back in 2017. In December 2018 it was revealed that J-Coin will be managed through a specialised mobile application to provide cashless payments. The latest press-release by the Mizuho Financial Group confirms that the J-Coin Pay app will launch on iOS and Android on March 1st, allowing users to transfer funds and pay at stores. Over 60 financial institutions are planning to join J-Coin Pay, and around 20 retail services and other companies are looking into using it. Banco BTG Pactual SA, Latin America’s largest investment bank, is planning to release its security token ReitBZ, which will be backed by distressed real estate assets in Brazil. The bank has been exploring cryptocurrency for years, but decided that it was too volatile finally turning to security tokens instead. Investors will be able to purchase the token during the 90 day ICO period. In addition, Julius Baer, a major Swiss private investment bank, announced its partnership with SEBA Crypto AG, a cryptocurrency-focused bank. The company noted an “increasing demand” for digital assets, and is ready to provide its clients access to cryptocurrencies. The parties have already finalized their collaboration, and are now waiting for the FINMA banking and securities dealer license. J.P.Morgan’s announcement has created quite a stir. Some crypto enthusiasts predict that this move from a major financial institution will bring trust and mass adoption, while others are outraged that a bank would exploit the name of cryptocurrency to achieve its objectives. Enterprise blockchains have already become a rather common thing, and it might not be long before we see a wave of new enterprise coins inspired by JPM Coin.